Last night, I took the F train into Manhattan after being restricted to the borough of Brooklyn for almost a week in the aftermath of Hurricane Sandy. It was a surreal experience. The city was as quiet as I’d seen it since 9/11. Practically, the only cars on the street were taxi cabs, outnumbering other cars 10 to 1. There was a tension on the trains punctuated by supportive smiles and silent nods from other passengers. 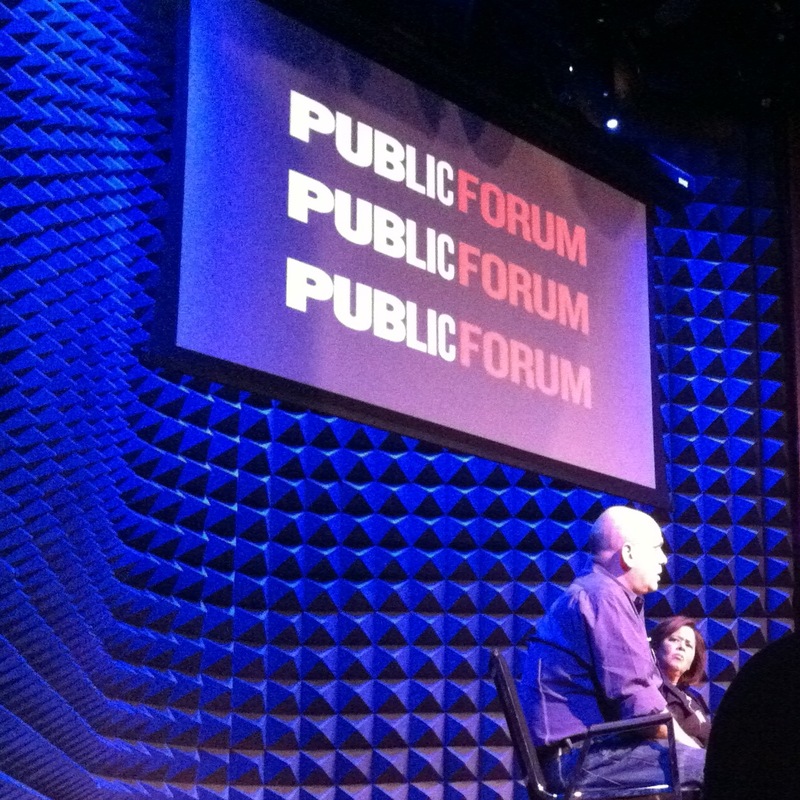 I went to Manhattan to attend a talk, The Public Forum at Joe’s Pub, featuring two of my artistic heroes, solo performer Anna Deavere Smith and David Simon, creator of “The Wire.” They talked about their work processes, the music of speech, and, of course, Sandy. It was great being in a theater for the second time in as many nights, and hearing them speak in a place I consider a home was healing. One of the most poignant moments came when Ms. Smith spoke about how tragedies can invigorate creativity. They spur artists to vehemently return to the work because artists make art. She expressed her anticipation of rejuvenated creativity and related it to shopkeepers returning to work after Hurricane Katrina. This is who they were, and if they didn’t open their shops, their lives lost meaning. The Forum inspired, indeed. Mr. Simon shared how he records actual background conversations for all his productions instead of the traditional “peas and carrots” walla typically taped because it works as a soundtrack – the music of conversation. Ms. Smith insists on word perfect recitation of the interviews she performs because every “like” and “um” represents the soul of that person. I left Joe’s Pub on cloud nine. After the talk, I was supposed to connect with my wife Christy, who was teaching yoga in the neighborhood, but my phone died and I couldn’t call her. We planned to meet up and ride the subway back to Brooklyn together. Instead, I hopped on the F train at Broadway-Lafayette, resigned to ride home solo. When the train pulled into the Delancey street station, I peered out the train’s window, hoping Christy might be on the platform, since that is where she typically catches it. Low and behold there she was. My train car passed Christy, and she didn’t see me in the window. She boarded the train two cars behind me, so I had to walk back to surprise her. At the next stop, I was able to skip to her car and sneak up on her, smiling big, hoping for a hug. Fight? What’s she talking about? Where? She pointed to the end of the car, and I saw it: Two men – one big, young guy and another, older, homeless man. They yelled at each other. The young guy was pissed because the homeless man was staring at him. The homeless man shouted that he wasn’t looking at the young guy. Christy hesitated, but the fight escalated, and it seemed punches might fly at any moment. She stood, and we went to the next car, fleeing the fight. Through the end windows of our new car, we safely watched the young guy, inches from the homeless man’s face, screaming. Finally, as the train pulled into the Jay Street-Metro Tech station, the young guy lifted his arm and slammed it against the homeless man’s face. The homeless man dropped to the ground, and the young guy grabbed his own travel bags, exiting the train onto the platform. Dazed, the homeless man stood up, scrambling for the young man, but then he realized he was leaving his own bags. He went back for his bags, grabbed them and stumbled onto the platform where I assume they continued fighting. The F train pulled out, and we headed home, both shaken by the experience. A woman sat across from us. She was eager to recount the altercation blow by blow. How she evacuated the fight car, too. How the young guy had also yelled at her when she sat across from him. She speculated he might be displaced by the storm. He had travel bags. Maybe he was going home. Maybe he was an evacuee, headed to a friends’ place in Brooklyn. Whatever the case, he was disproportionately angry, and the homeless man got the brunt of that rage. Soon, she spoke about the storm. She’d been volunteering in Red Hook and Coney Island, and the stories she shared were harrowing. She and her friend purchased saris in Jackson Heights and took them to Coney Island because women who wouldn’t leave their homes uncovered for religious reasons had been wearing wet, moldy saris for days. In the Red Hook Housing Projects, there are many elderly residents who didn’t evacuate and won’t leave. There is plenty of support from Red Cross on the ground, but the residents won’t evacuate. One elderly lady’s apartment had wet, moldy carpeting and was infested with rats and raccoons. The woman begged the older lady to let her carry her down 12 flights of stairs, but the older lady wouldn’t abandon her home. The woman told us she must get a hepatitis shot because she’d been wading in waste for two days. Christy and I arrived at our stop, leaving the woman on the train with faint smiles and weak waves. We felt gut punched. It was hard to talk for a few minutes, grappling with the fight we witnessed and the woman’s tale. After a detached week watching devastation on the news, we heard first-hand accounts of what it looks like inside the madness. We saw the affects of madness on men. We tried to make sense of our fortune of living at the highest elevation in Brooklyn, a place barely touched by Sandy’s wrath. Then, I remembered the conversation of Ms. Smith and Mr. Simon just an hour earlier. As an artist and a writer, it is my job to share these stories. It is my job to reflect the madness of victims and triumph of heroes. It’s important to get back to work. For many, this may not be possible for a while, but it is important to return as soon as we can. I can return to work now. I can help others with not only my donations and service, but by writing and sharing stories. It doesn’t matter if you sell coffee, teach yoga, work in a skyscraper, or entertain and educate through artistic creation. As soon as you can, get back to what you do best. It adds your unique voice back to a wondrously diverse symphony – the music of our city. Coney Island Staging area @ 2770 West 5th Street Between Neptune and West Ave. I love your observations, JD. My college has been closed for over a week and I feel like I really need to get back to normal now. At first, it was, YAY, no school! but now I want to get back to doing what I do! I’ve done some extra volunteering at the hospital, and yes, it does a lot of good to help others. Cyndee – What you’re doing is perfect. If you can’t do what you typically do, do something good for others. It helps someone in need, and you’ll keep busy. Stir crazy television watching is enough to drive anyone mad! Thanks for sharing.